The soldiers were in the trenches. There is a trench at the edge of the field. These creatures live in deep ocean trenches. The army trenched around the town. The farmer trenched the edges of the field. For the best results, you should trench your vegetable patch. These plants should be trenched. 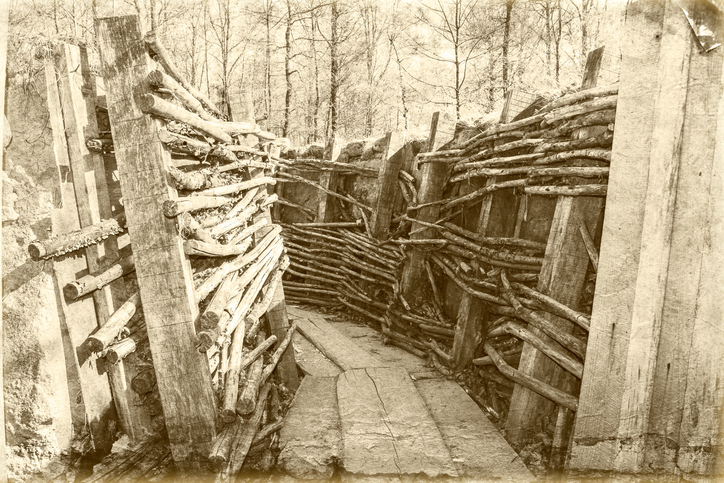 trench warfare: battles fought by soldiers using trenches to shelter from enemy fire. trench coat: a coat worn by soldiers in the trenches of the First World War or a coat in a similar style. trench foot: a condition affecting the feet, caused by them being cold and wet for a long time. The condition gets its name from the fact that soldiers in the trenches in the First World War often suffered from it. The movie is based on the novel of the same name by Pat Barker. In general use, trench and ditch are interchangeable. However, ditch is not used for the military sense of trench, nor is it used for trenches in the ocean. Trench dates back to the mid-14th century. The late Middle English noun trenche, meaning ‘a path made by cutting’ or ‘a track cut through the woods,’ came from the Old French trenche (‘a defensive ditch’ as well as, more generally, ‘a slice, cut, slash or gash’), from the Old French verb trenchier (to cut or slice). It can be traced back to the Vulgar Latin verb trincāre. Linguists disagree on whether this verb meant ‘to cut in three parts, based on the root trini meaning ‘three,’ or whether is was a variation of the Latin verb truncāre (‘to cut off or lop’ as well as ‘to maim or mutilate’), which derived from the Latin truncus, meaning both ‘trunk of a tree or the trunk of the body’ (as a noun) and ‘maimed or mutilated’ (as an adjective). Its origin is uncertain, but linguists think it may have come from one of two Proto-Indo-European roots: tere- (to cross over, pass through or overcome) or twerk– (to cut off or carve), which may themselves be related. Trench is related to the French tranche (trench), as well as the Latin prefix trans– (through), which is still used in many words in different modern languages, and English words such as trunk, truncate, transient, thrill, thorough, through, nostril and avatar. The sense expanded to ‘long, narrow ditch’ in the late 15th century, and has been used in the military sense since around the year 1500. The term trench coat was first used in 1916, while trench warfare appeared in 1918. The verb comes from the noun, and has been used since the mid-16th century.